This is a private tour, We will assign private guide and van in each city and no other participants will be allowed to join in your group. Also the tour is totally flexible. You can start your own tours at anytime as you like. Moreover, if you would like to do some adjustment in this itinerary, please Email(ebiz@dditours.com) in what area you are not satisfied, we can adjust the itinerary according to your every request. On arrival in Beijing, you will be met & transferred by our professional English speaking guide to your hotel. Enjoy the rest of the day at your leisure. Buffet breakfast at hotel, visit the Summer Palace, then explore old town of Beijing(visit Hutong by rickshaw), lunch at the Hutong family followed by transfer to the airport for flight to Urumqi. Upon arrival, meet and transfer to your hotel. Hutong: A hutong is a unique form of community that exists only in China. If you are fed up with high buildings and wide streets, enter Beijing’s hutongs then. Here, you will find "Hutong Culture". The Summer Palace: the best-preserved imperial garden in China. Buffet breakfast at hotel. Full day visit to Heavenly Lake, Xinjiang Minority Peoples' Museum, Bazaar . Xinjiang Minority Peoples' Museum: It offers an impressive collection of exhibits, covering artifacts and relics from more than 12 minority groups. The lay out and presentation of the exhibits is imaginative, along with the 3000 year old mummies. Bazaar: It is the place where merchants wheel and deal as they have for century. It is also an ideal place for you to buy some souvenirs for your beloved ones. Buffet breakfast at hotel, then drive to Turpan. 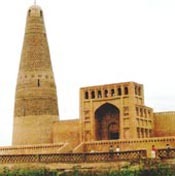 Visit the Jiaohe Ruins, the Karez Well and the Sugong Pagoda. The Jiaohe Ruins: It was the capital of the state of South Cheshi, one of the kingdoms of the Han dynasty (206-220BC). The Karez Well: It is an irrigation system of wells connected by underground channels. Karez systems are the crystallization of ancient people's diligence and intelligence. The Sugong Pagoda: It is the only Islamic tower among the hundred famous towers in China. Full day trip to the Gaochang Ruins, the Baizikeli Thousand Buddha Cave, the Astana Tombs and the Flaming Hill. The Gaochang Ruins: The ancient walled capital of the Uighurs which flourished between the 7th and 14th centuries. The Flaming Hill: The mountain is combination of red sand and rocks that makes the mountain looks like a red dragon sleeping on the area basin. The Bezaklik Thousand Buddha Grottoes: It contains 67 caves dating from the Northern and Southern dynasties (317 - 589) to the Yuan dynasty (1279 - 1368). After breakfast, drive to train station for high speed train to Liuyuan (about 3.5 hours). Upon arrival, meet an drive to Dunhuang. Lunch at local Chinese restaurant. In the afternoon, visit Mogao Caves. Mogao Caves: The Mogao Caves, a shrine of Buddhist art treasures , also known as the Thousand Buddha Caves. Buffet at the hotel, visit theMingsha Shan and the Crescent Lake. Transfer to the airport for flight to Xian in the afternoon. Upon arrival, meet & transfer to your hotel. Mingsha Shan and the Crescent Lake: The lake and the Sounding Sand Dune which can make sounds when the wind passes are located in the place where the sand and the oasis meet. Buffet breakfast at hotel. Full day excursion to world famous Terracotta Warriors and Horses with circle movie showed before returning to the city for visit of the big wild Goose Pagoda and the Courtyard of Family Gao with Shadow Puppet Show enjoying. Lunch at good local restaurant. You can choose the Tang Dynasty dinner Show as optional in the evening (highly recommended, as it is the best show in China). The Terracotta Warriors and Horses: The most significant archeological excavations of the 20th century, the army of terra-cotta warriors and the bronze chariots entombed in vast underground vaults at emperor Qin’s tomb. 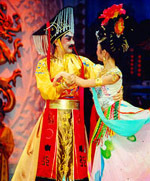 The Tang Dynasty Dinner & Show: The show that presents the palace dances and sings in the Tang Dynasty. The Big wild Goose Pagoda: It is one of the city’s most distinctive and outstanding landmarks, possibly the most beautiful building left in Xi’an today. In AD 652, the Big Goose Pagoda was built to store the sutras and the figurines of Buddha, which were brought from India by a famous Buddhist translator and traveler Tang Sanzang, also known by his Buddhist name as Xuanzang. The Courtyard of Family Gao: The Courtyard of Family Gao: Located in Xian’s bustling shopping area, Gao’s Courtyard is the former residence of Ming Dynasty.The residence is well preserved or restored to replicate the originals. Xian Art Gallery works in the main houses and you can enjoy local Shadow Puppet Show here. Buffet breakfast at hotel. then visit Shaanxi Historical Museum, Ancient City Wall. Lunch at local good restaurant followed by transfer to the airport for flight to Beijing . Upon arrival, meet & transfer to your hotel. The Provincial Museum: Which is one of the best Museum in China and where you can learn a lot about the 5,000 year brilliant history of China. The Ancient City Wall: Xian City Wall was constructed in the early Ming Dynasty on the basis of the Imperial City of Chang An (Everlasting Peace) of the Tang Dynasty. Buffet breakfast at hotel. Free until transfer to the airport for flight to the next destination. Meals: Any meals which are not specified with "B", "L", or "D"
Prices quoted are subject to rooms availability at the time of booking is made. Prices are valid until December, 2019 and prices are not available in major holiday (October 1- October 7, Feb 4- Feb 20 ) in China. Our Price are subject to change of the exchange rate between US$ and RMB changes by 2% or more(Now: US$ : RMB=1 : 6.9). 4) The prices listed include a discount for cash payment either by wire transfer, for any other type of payment, the discount price may not apply and subject to certain amount surcharge.